A firm commitment was made by the Taoiseach during the last Dáil that a full-scale debate on collusion would be held following the publication of the report of Patrick McEntee SC into the Garda and government investigation of the Dublin and Monaghan bombings of 1974. The McEntee report was published in April 2007. The promised debate was not held soon thereafter as promised. 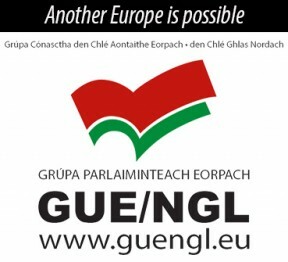 Nor was it held during the remainder of the 29th Dáil. Only now has the government finally scheduled this debate. This has been especially disappointing and frustrating for the families of victims of collusion. The form of the debate is unsatisfactory as there is no motion and no proposal for action. I have to say it is also frustrating in the extreme that this debate has been given a title that does not mention the word collusion. The investigations by Justice Barron, the reports of the Joint Oireachtas Committee and the inquiry of Patrick McEntee were not, as the title states vaguely, on ‘violent incidents arising from the conflict in Northern Ireland’. They were on attacks, including mass murders, where British state collusion with unionist paramilitaries was strongly indicated. Throughout the long search for truth on collusion there has been an attempt by some to muddy the waters, a process that serves only further to shield those at the highest level in the British state who bore ultimate responsibility. I hope that muddying of the waters is not repeated in this debate. To the shame of successive Irish governments they co-operated to a great extent with the British Government in its so-called security strategies. They turned a blind eye to collusion. British agents worked within the gardaí. There was open co-operation with the RUC during the worst phase of its repression against the nationalist community in the Six Counties. Political prisoners were extradited to face the Diplock Court system and even as the Irish Government politely protested about the fate of the Birmingham Six and the Guildford Four and other victims of British state injustice, it was sending its own citizens into that system. This is the reality which many in this House, now as in the past, are unwilling to state. • The bombing of Belturbet, Co. Cavan in December 1972 in which two teenage civilians were killed – Geraldine O’Reilly (15) Patrick Stanley (17). • The Dublin bombings of December 1972 and January 1973 in which three bus workers were killed - George Bradshaw, Thomas Duffy and Thomas Douglas. • The killing of Briege Porter and Oliver Boyce by the UDA near Burnfoot, County Donegal in 1973. • The Dublin and Monaghan bombings of May 1974 in which 33 people died - 26 in Dublin and 7 in Monaghan. • The killing of IRA Volunteer John Francis Green in Co. Monaghan in January 1975, probably by a British Army operative. • The stabbing to death of civilian Christy Phelan near Sallins. Co. Kildare in June 1975. • The explosion at Dublin Airport in November 1975 in which John Hayes was killed. • The Dundalk bombing of December 1975 in which two civilians were killed - Hugh Watters and Jack Rooney. • The Castleblayney bombing of March 1976 in which one person, Patrick Mone, was killed. • The killing of Seamus Ludlow in Co. Louth in May 1976. • The killing of Sinn Féin Councillor Eddie Fullerton in Donegal in May 1991. • The killing of IRA Volunteer Martin Doherty in May 1994, having foiled an attempted bombing and mass murder at the Widow Scallan’s pub in Dublin. To these tragedies in this jurisdiction should be added the killing of three members of the Miami showband near Newry in July 1975. 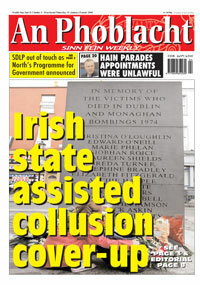 The web of collusion links their murders to that of the Dublin and Monaghan May 1974 victims and to John Francis Green. The link with British Army Captain Robert Nairac and the Portadown UVF is also well known and is but one facet of the long history of collusion. Under-stated as it was the McEntee report highlighted a massive failure on the part of this State to properly investigate the Dublin and Monaghan bombings of May 1974. The only logical explanation for what took place is a cover-up of collusion. Gross incompetence is not enough to explain the failure to investigate and the apparent destruction of records. The report again exposed the refusal of the British authorities to co-operate with a Commission of inquiry established by the Oireachtas. Both the British and Irish governments have failed to establish the inquiries repeatedly sought by relatives seeking truth and justice. This is despite statements such as those by the Taoiseach as recently as 10 December 2007 when he said that the suffering of victims had been sharpened “by the clear evidence of collusion by the security forces in many murders”. It is now nearly two years since the All-Party Dáil motion of 8 March 2006 which called for the immediate establishment of a full, independent, public judicial inquiry into the murder of Pat Finucane. The British Government has refused to establish such an inquiry. It persists in proposing a flawed form of inquiry which would be under the effective control of a British minister. The Irish Government’s case in calling for a full inquiry has been undermined not only by its own failure to establish collusion inquiries but also its own similar Tribunals of Inquiry Bill. Two months after the Dáil unanimously passed the all-party motion calling for an inquiry into the murder of Pat Finucane, Ken Barrett, the only person convicted in connection with the murder, was released after serving three years. He was brought by the British Ministry of Defence to a secret hideout outside Ireland. In the case of Ken Barret, a deal was done and a guilty plea ensured that there was no trial and no exposure of the central role of British forces in the murder. The same thing happened with the other British agent involved in the Finucane murder – Brian Nelson. So collusion is ongoing. The British are still protecting their agents. They have refused the demand of the Oireachtas for an inquiry. I want to repeat Sinn Féin’s demand for the Taoiseach to hold a special summit meeting with the British Prime Minister solely focused on the issue of collusion. The Taoiseach should use such an opportunity to demand of the British Government that they provide access to all the original documents relating to the acts of collusion carried out in this jurisdiction that I have cited and indeed to the whole record of collusion in their possession. The search for truth and justice is far from over.